When you’ve been in the corporate event business as long as Casino Knights, you know company parties are more than just a ton of fun. Don’t believe us? Sure, we may be a little biased, but others have made the same observation. Studies from a variety of organizations, companies and educational institutions agree that having a corporate party off the clock can improve performance during work hours. A tight-knit team is going to get more done and run into fewer issues than an office of disjointed individuals. Now that there's one more generation in the workforce, bringing everyone together as a team can prove to be very challenging. A corporate event is a great way to build rapport out of the office that ultimately strengthens the team when they’re at work. If the corporate party is a celebration of the company hitting a goal or an important milestone it can also create a sense of common purpose among all the employees. When everyone is united with a singular purpose teamwork comes naturally. One reason why parties help forge stronger teams is people make personal connections that they wouldn’t normally make in the office. This is especially true when you incorporate interactive activities like casino games that encourage people to talk. People will get to know one another outside of their job role and may find that they have similar interests. The hierarchy and departmental divides also break down during social gatherings, allowing people to mingle in ways that they wouldn’t at work. As a result everyone is more comfortable interacting with each other in the future. This sets the stage for building relationships and even friendships. Studies have shown that employees who have genuine friends at work are happier, and happy employees are more engaged, satisfied and productive. A company party is an opportunity to increase business. For starters, all the event vendors you use could turn into clients. You can also invite other vendors, partners, customers and potential clients so you can network during the event. It’s a great way to build rapport before doing business. You can also use the party to create a marketing campaign. In the days and weeks leading up to the event you’ll have a reason to contact people on your email list, promote the party at the venue and make mentions on your social media accounts. A corporate party will also show employees that the higher ups appreciate their hard work and want to give back with more than just a paycheck. During the event the CEO or one of the founders can also publicly acknowledge the progress and hard work that all the employees have made. Public accolades are a very effective way of improving employee morale and encouraging them to continue putting forth effort. When you invest in your employees they are more likely to be invested in your company. As noted above, a corporate event is one way to show employees that you’re invested in their happiness and career success. Including all employees in company celebrations will also give everyone a sense of ownership that can translate into better productivity. If you decide to hold a charity event or open house, a corporate event can turn into major exposure in the local community. It gives you a reason to promote within the community and even give back in a meaningful way. Numerous studies from groups like PriceWaterhouseCoopers have shown companies who are active in their communities have better reputations and employee retention. One of the quickest ways to kill productivity is to let stress keep building. Employees and managers need to blow off steam every once in a while and hit the re-set button. If not, it can become a chronic problem that affects a person’s physical and mental health. Once that happens, employees will be less engaged and miss more days of work, both of which lower productivity. 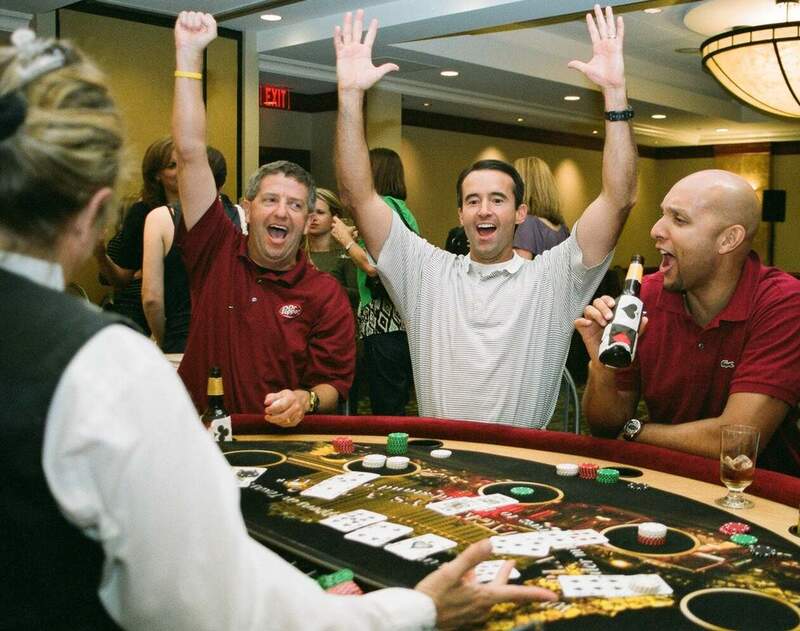 Casino Knights can help companies of all sizes throw a casino party in Central Texas that will get guests talking, laughing and having a good time. It’s an entertaining way to celebrate a win, raise money for a good cause or introduce your business to the community. Give us a call to discuss how we can turn your next corporate party into an event that’s worthy of the Vegas strip!